Cimtec offers a complete PGIS option that allows facilities to consistently grade products based on visual characteristics as they pass through the manufacturing line. Many visual inspection systems rely on stored database information to determine whether or not a item meets manufacturing specifications. In order to create these baseline data, optimal product information has to be added to the data base. A Product Grading and Inspection System (PGIS) uses CCD-based machine vision technology to image products and add this information to the manufacturing database. Products on the production line are also imaged in PGIS stations, and their data compared to the standards stored in the database. Cimtec offers a complete PGIS option that allows facilities to consistently grade products based on visual characteristics as they pass through the manufacturing line. The goal of the PGIS is to create a “gold standard” that all subsequent products are compared to. The Cimtec PGIS system assigns a numeric grade to the product that is based on customer requirementsandtherelativegrayscaleoftheacquiredimage. Asadefault,therearethree grading levels that can be adjusted based on customer needs, but the system can accommodate up to 256 grade levels, meeting the needs of the most complex and discrete imaging and inspection processes. 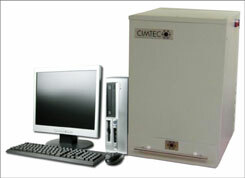 The Cimtec PGIS system consists of a containment enclosure, Cognex vision system hardware, lighting, optics, and electronics, all of which are pre-configured by Cimtec before delivery. The containment enclosure consists of a sturdy sheet metal exterior with a precisiondrawerthatslidesinandouttoallowsampleloadingbytheoperator. Thedrawer alsoincludesaplasticinsertthatcanberemovedforcleaning. ACognexCCDmachinevision cameraisusedfortheimageacquisition. HighfrequencyfluorescentbasedlightingorLED lighting is used to illuminate the product inside the enclosure. The PGIS can be connected directly into an existing network for data storage, and the system is packaged with all of the required software. Customers also have the option of connecting the PGIS system to a PC with color model for real-time evaluation of the imaging process. After imaging, data can be displayed on a computer monitor or stored to a hard drive, removable media, network server or even printed out to paper. To operate the PGIS, the operator places the product to be graded into the drawer of the containment enclosure, then slides the drawer closed. The actual imaging process is fully automated, requiring the operator only to press a button to start the process and to enter identification information for the specific product. This identification system is generally based on the product model, but may also include other identifiers such as manufacturer, date, or other data. The data from the image is compared with the data for various grades stored in the facility base, and a grade is assigned to the specific product being inspected. Multiple PGIS units can be installed throughout a facility to provide consistency in inspection across different production lines, with all referring back to a specific gold standard stored in the central database. This consistency improves all-around quality assurance within one manufacturing facility, and even across multiple facilities or manufacturers.